Left Coast welcomes you to our Thanksgiving Open House weekend. We will feature a special tasting flight with holiday deals in the winery and our famous wood-fired pizza in the Cafe. This year we will also host an exclusive culinary experience each day at 1PM and 3PM. Limited seats available, RSVP today. $40 general admission, complimentary for Legacy members, $20 Founders and Sparkling members, $30 45 North and White Pinot Club members. Help reduce waste by bring in your empty wine bottles for recycling and receive 5% off any wine purchase! Start thinking about which bottles you need for the holiday season. This offer is 5% off per person and does not reflect the number of bottles to be recycled. Catch us pouring at OMSI After Dark for Corklandia Presented by Country Financial at OMSI After Dark on Friday, November 9th! Get your fill of wonderful wines and fantastic food plus you can enjoy the museum at night with no kids! This 21-and-over event is perfect for a date night or fun with friends. For those of you who celebrate Halloween, visit our Tasting Room in costume and receive a complimentary tasting. Candy treats will be available for the young trick or treaters too! 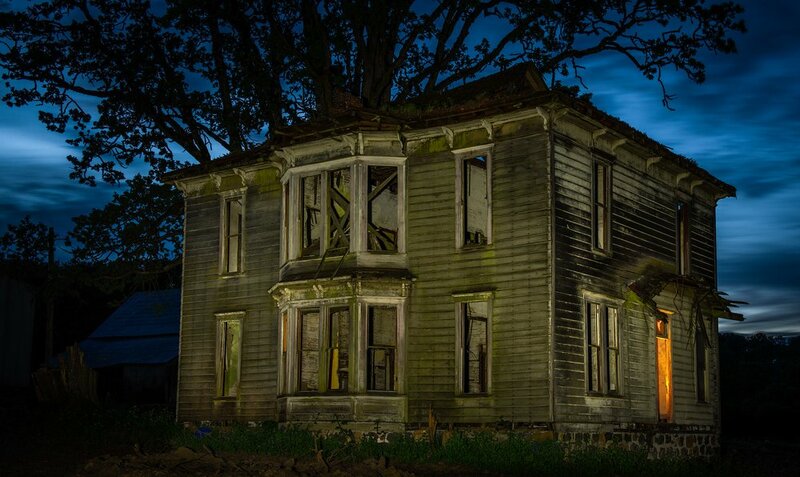 Taylor will lead a historic walking tour of the abandoned farm of our new property. Join us at the 2018 Wine & Jazz Festival at Deepwood Museum & Gardens on Saturday, October 13, 2-6 PM. This annual event is a favorite for all of us. It gives us an amazing opportunity to pour for you outside of our tasting room. This year the Wine & Jazz Festival be doing a celebration of harvest. There will be a variety of food to pair with the wine and beer as well. As an added bonus the live music makes the event even more fun for guests and all of us working the event. CEO Taylor Pfaff will be leading a tour from grapevine to fermenter. Harvest will be in full swing so we will taste some grapes off the vine. Watch picking and pick a few clusters ourselves. After an hour in the vineyards we'll head over to the winery and get an in depth look at the winemaking processes taking place that day. Harvest time is here. Join us with celebrate the release of some new vintages. The Tasting Room will be closed to the public. This day is to show our appreciation to you as we roast a pig and have some harvest tours for you. While here make sure to pickup your fall club shipment and maybe another case or two for the holidays. We look forward to spending time with you all. Hope to see you there. Bring your vineyard dog out to Left Coast for a little walk through our vineyards and make some new friends. We will take you and your furry friend on a 1.5 mile romp through the vineyards and our hiking trails. You and your pup can enjoy the views of our beautiful Estate. When we get deep into the trail, you can let your dog free off leash, if they are well trained, and we will also have a tasting station nestled in among the vines. After the walk, feel free to settle in at our Tasting Room Patio or any of our outdoor seating with your dog. Please keep dogs on a leash around the Tasting Room, and remember that they are not allowed inside any of the buildings. We will be offering wine tastings, bottle and glass sales paired with our famous wood fired pizza. The 2018 harvest kicked off on September 7th with a pick of Pinot Meunier for our sparkling wine program. Picking will begin to ramp up this week and continue through until the end of October. Please be mindful for tractors and vineyard workers as you drive up to the Tasting Room. For an in-depth harvest experience sign up for our final Sunday School of 2018 on October 7th. Join us this Sunday as we welcome Dr. Andrew Martin. He will teach us the importance of atmospheric rivers. "Water moving across the earth in river channels is familiar to all of us, but it also moves in channels across the sky! These channels are called atmospheric rivers, and they are critically important ingredients to the climate, especially along America’s “Left Coast”. Explore what causes atmospheric rivers, how common they are, and why they are important to both water supply and flooding in the Willamette Valley." 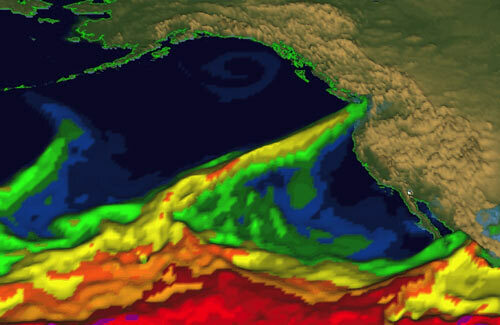 Image below is an enhanced satellite image of water vapor flowing to the Pacific Northwest in an atmospheric river.